Publisher: Accademia della Crusca, 1595, Florence. Impossibly rare. Condition: Hardcover, full leather. About 16.5cm x 9.5 cm. Rubbing and wear on boards, but spine is mostly good. 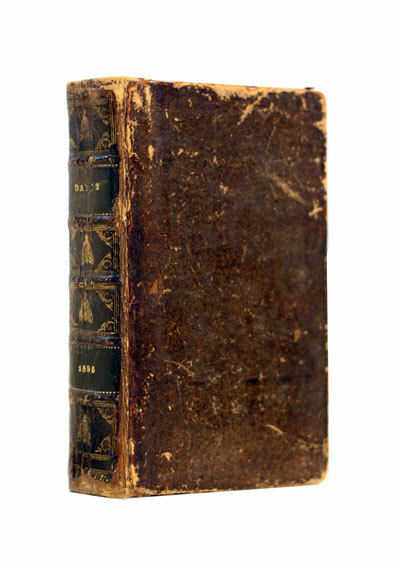 Engraved title page is missing, otherwise text is complete and firmly bound. Front hinge neatly reinforced. In very good condition for its age. Some stains, wear to pages commensurate with age. 1inch square piece missing from bottom right corner of Manetti’s map, not affecting the map but with some commentary text lost. Half square inch missing from a couple of page corners, largely not affecting text (almost no loss to text). With decorated capitals throughout. An important and now extremely rare edition from 1595 – the first “concrete attempt at a modern critical edition”. 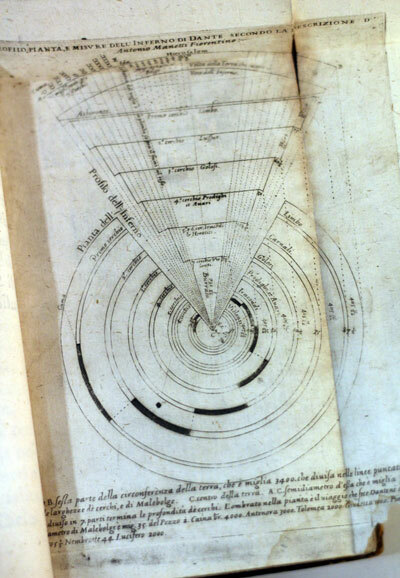 It has a “new diagram” of Dante’s Hell by Antonio Manetti, which is of historical significance. See below. All text is in the original Italian. Antonio Manetti (6 July 1423 – 26 May 1497) was an Italian mathematician and architect from Florence. He was also the biographer of the architect Filippo Brunelleschi. 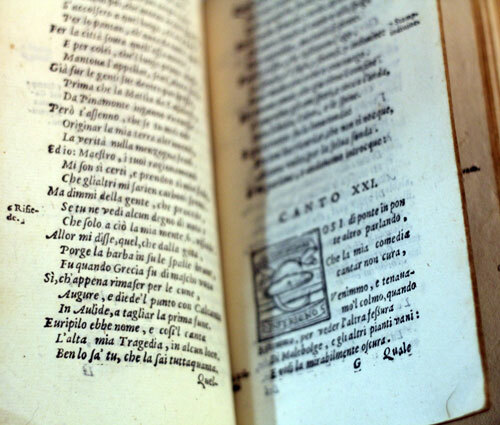 Printed in Florence by Domenico Manzani (active 1583-1606), also known as Domenico del Gatto (of the Cat) for his printer’s mark, the Crusca edition presented emendations and variants with justifications for these in both the inside and outside margins. 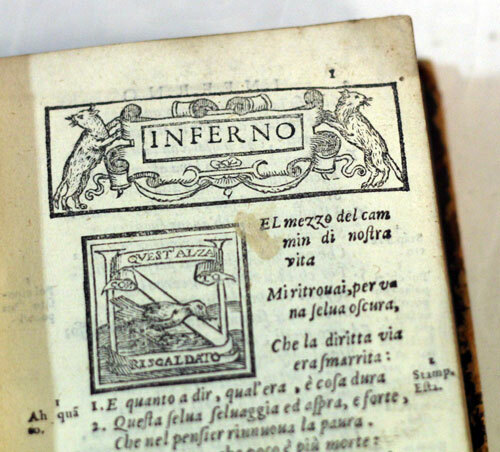 The edition also included a new diagram depicting Antonio Manetti’s theories about the geography of Hell. The Crusca Comedy appeared with 465 readings explicitly corrected vis-à-vis the Aldine, as well as many others tacitly introduced, bringing the total to approximately 650 variants, that is, six or seven for each canto. It represented the first concrete attempt at a modern critical edition. Unfortunately, the editors did not undertake the work with the clear criteria and scientific objectivity.They failed, for instance, to take into consideration many readings upon which almost the entire tradition had agreed, while sometimes they indicated in the margins readings which had only one manuscript as their authority. Often the preference for a given reading is arbitrary, motivated primarily by aesthetic considerations, with the authority of the manuscripts bearing only secondary importance. That the academicians recognized the inadequacies of the results achieved is demonstrated by the decision, taken a few years later, to undertake a second edition of the Comedy through a new exploration of the manuscript tradition. This revised edition remained an unfulfilled promise however. 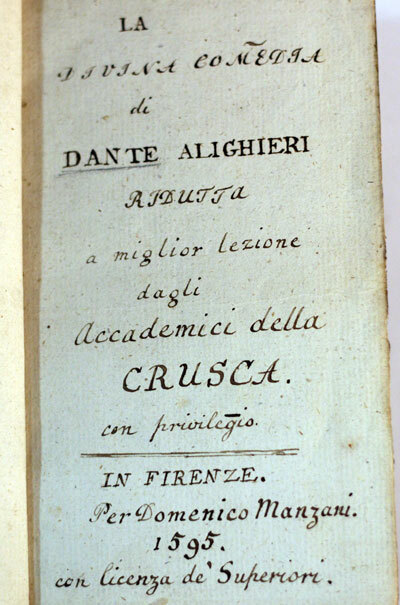 In 1716 there appeared an edition “ridotta a miglior lezione dagli Accademici della Crusca,” (newly corrected by the Crusca Academy) but the text was the same as that of 1595. (From The Reniassance Dante in Print online exhibition). The Accademia della Crusca (Crusca Academy), still today the national language academy of Italy, was the first such institution in Europe and the first to produce a modern national language Vocabolario (1612), later taken as a model by other European states. The Academy developed out of the informal meetings of a group of Florentine intellectuals (including A.F. Grazzini (Il Lasca), Giambatista Deti, Bernardo Zanchini, Bernardo Canigiani, Bastiano de’ Rossi) between 1570 and 1580 in the bookshop of the Giunti near the chapel of S. Biagio of Badia. They ironically called themselves “Crusconi” (the bran flakes) with the intention of giving a jocular tone to their conversations, impatient as they were with the solemnity surrounding the erudite but futile discussions of the Sacra Accademia Fiorentina. In 1582 the Crusconi gave formal status to their assembly, christening it with the name of Accademia. Leonardo Salviati (L’Infarinato, “the floured one”) joined the group at this time and gave it renewed impetus. Salviati interpreted in a new sense the name of crusca (bran): “… as if to say that the Academy should undertake a separation of the good from the bad.” Together with Il Lasca, Salviati gave the Academy a new linguistic direction, setting as its goal the promotion of a Florentine language according to the model of vernacular classicism established by Pietro Bembo, who idealized the 14th-century Italian authors, especially Boccaccio and Petrarch. The Florentines differed from the purist Bembo to the extent that they included their national poet Dante among this privileged group. 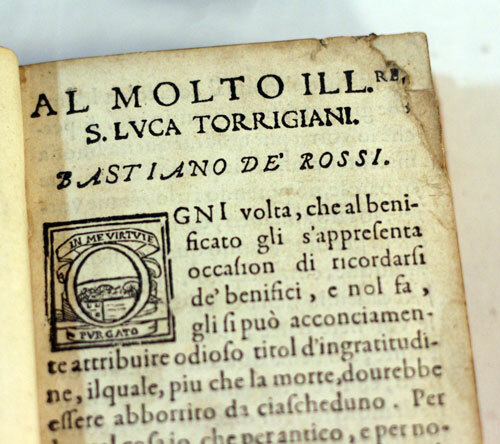 Salviati also personally promoted the creation of a Vocabolario, in which he planned to gather and declare “all the words and manners of speech, which we have found in the best writings, which were done before the year 1400” (Avvertimenti l. II, cap. xii.). When the number of members reached 43, and the offices and responsibilities of the members were established, it was decided that each member should adopt a nickname, motto, and device having to do with bran and the oven. Some of the devices can be seen in the capitals of the 1595 edition of the Divine Comedy. At the meeting of 6 September 1589, it was decided that the Archcounsel, Giambatista Deti, should find a motto for the Academy’s device, a flour bolter. “Il più bel fior ne coglie” (She picks the fairest flower), a hemistich from Petrarch was eventually chosen as the Academy’s motto. (From The Reniassance Dante in Print online exhibition).